Available on Chasing Pirates Remix EP. 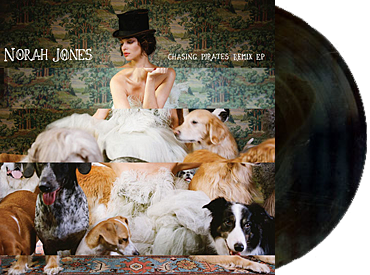 "Chasing Pirates" is the opening track on Norah Jones' 2009 album, The Fall. The Droogs remix was done by Beck, his right hand man, Brian LeBarton, and his engineer, Drew Brown. The original version of the song has a languid sexiness to it (and Smokey Hormel on electric guitar). The Droogs collective replace all that with stuttery electronic beats and fuzzy effects. Initially, as a type of promo, Norah Jones gave one remix of "Chasing Pirates" to three different websites--and one of the sites (artistdirect.com) got the "Droogs Remix." A little later, a vinyl 7" was sold on norahjones.com which contained all the remixes. As you may recall, Beck and Norah Jones once performed "Sleepless Nights" together. A handful of Beck's musicians appear on Norah's album, The Fall (Joey Waronker, James Gadson, Smokey Hormel, and Lyle Workman), and she told Pitchfork that she thought about asking Beck to produce it, but didn't even ask. I think he would've said yes!